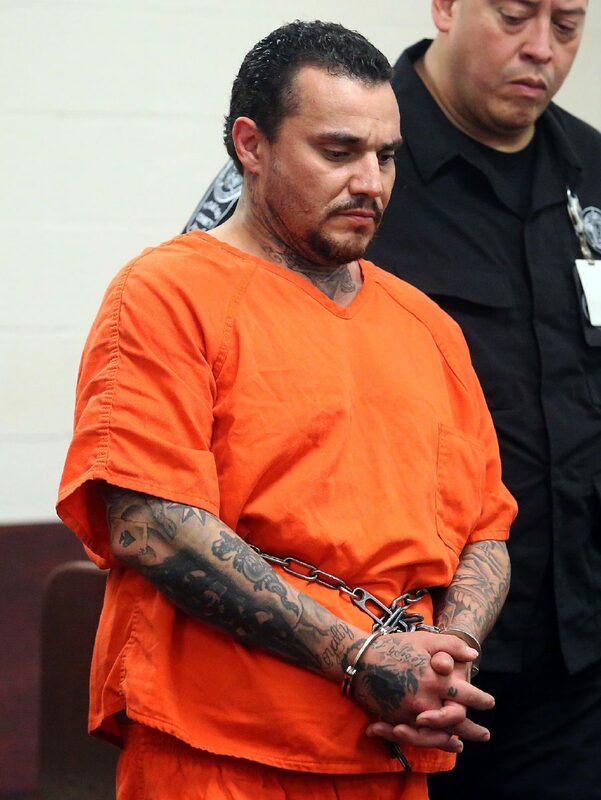 Joseph Robert Nocar, 39, listens to charges as he is arraigned for the death of his father at the Hidalgo County detention facility Wednesday, Oct. 31, 2018, in Edinburg. EDINBURG — An Elsa man was arrested Wednesday for the alleged murder of his father, the second homicide case the Hidalgo County Sheriff’s Office is investigating this year. Joseph Robert Nocar, 39, was arraigned the same day on a first-degree murder charge for the death of Frederick Joseph Nocar, 76. Sheriff’s deputies found the elder Nocar lying in a pool of blood in his Weslaco home on Monday evening, according to Sheriff J.E. “Eddie” Guerra. An autopsy revealed he died from blunt force trauma to the head and from being “chopped” with a blunt object. Sheriffs made the gruesome discovery after Frederick’s daughter contacted law enforcement after she had been unable to get in contact with him for more than a week, Guerra said. Investigators subsequently received an anonymous tip naming Joseph as being involved with the murder, according to the probable cause affidavit, and after receiving written consent from Joseph to search his truck, they discovered a drop of blood on the exterior of the driver’s side door. “A witness then came forward and informed sheriff’s investigators that he was told by Joseph Robert Nocar that he killed the victim and provided information about the injuries sustained by the victim that were not released to the public that were revealed to him by Joseph,” the affidavit reads. “We believe that our suspect has a substance abuse problem and we’re being told that he has assaulted his father in the past when his father had not given any money to buy drugs,” Guerra said as to a possible motive, adding that Joseph has a lengthy criminal history and is a member of a gang. At the time of the alleged murder, Joseph was on parole for a robbery charge. Justice of the Peace Jason Peña set his bond at $2 million. “I’m not here to say whether you’re innocent,” Peña said. No attorney was present at the arraignment. If convicted of the murder charge, Joseph could face up to life in prison. The first case occurred earlier in the month, when Mario Lozano Lemus allegedly fatally shot his mother-in-law and sister-in-law Oct. 13 in Alton. The sheriff’s office has issued an arrest warrant for Lozano Lemus, who is believed to have fled to Mexico. Nearly half of the 23 homicide cases HCSO investigated in 2017 involved domestic violence, according to the sheriff. Over the past 10 years, HCSO has averaged 17 homicide cases a year, and the last homicide case involving a father and son occurred in 2015. “One case of homicide is too many, but we’re very proud of the fact that so far this year we are experiencing a very low violent crime rate in this county,” Guerra said.